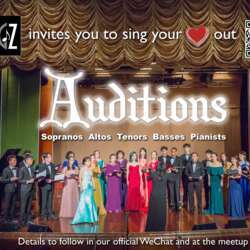 You must be a member of the Guangzhou Chorus Group to attend this activity. Would you like to join this group? We get to introduce our activities and welcome aspiring members for this concert season. Go through the experience of auditioning and rehearsing to gain knowledge on what it's like to be part of the choir. You'll meet people of similar interest and other members of InterNations who have joined us in the past.